Experience the breathtaking wilderness of Alaska on this 7-day tour that originates in the state’s largest city and takes you through Denali National Park and the Golden Heart City of Fairbanks. After arriving and spending time in Fairbanks, you will venture to Denali National Park where the 20,320-foot Denali, the highest peak in North America, often emerges from the clouds, granting perfect photo opportunities. Watch for grizzly bears, wolves, caribou and a wide variety of other wildlife including Arctic ground squirrels and bald eagles. Enjoy dinner and a show at the Music of Denali Dinner Theater at McKinley Chalet Resort featuring family-style dining and a spirited original musical about the first men to reach the summit of Denali. Overnight at the Mt. McKinley Princess Wilderness Lodge in the quaint town of Talkeetna and enjoy fine cuisine and luxury accommodations before heading to Alaska's largest city, Anchorage. Travel aboard Alaska Railroad's Adventure Class service (picture window) from Fairbanks to Denali. Upgrade to dome service available for purchase at check-out. 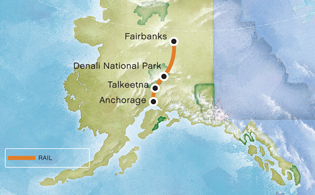 Upgrade your rail experience from Fairbanks to Denali for $100 per person. The standard tour features Alaska Railroad’s Adventure Class for this rail component of the tour. When you choose the upgrade, you will travel aboard Alaska Railroad's Goldstar service instead. Adventure Class railcars do not feature a dome and meals are available for purchase. Goldstar service is aboard Alaska Railroad’s domed railcars and breakfast aboard the train is included. With the standard option, rail travel from Denali to Talkeetna and Talkeetna to Anchorage is aboard our own luxury, glass-domed rail service (meals not included, but available for purchase) and the upgrade applies only to the portion of the trip from Fairbanks to Denali. To learn more about Adventure Class, click here. To learn more about Goldstar service, click here. Upon your arrival at the airport, we will transport you to your hotel. You will have the rest of the day to explore the Golden Heart City of Fairbanks. Overnight in Fairbanks. Before heading south along the Alaska Railroad Route, start your day with optional activities that include nine holes of golf surrounded by Alaska wilderness or an ATV adventure. Later, you will re-board the train to continue your journey to the Mt. McKinley Princess Wilderness Lodge. Once you’ve arrived, settle into your lodging for the evening and unwind after a full day. Overnight Mt. McKinley Princess Wilderness Lodge. Continue your train adventure today when you re-board your luxury railcar towards Anchorage. Explore Alaska's largest city upon arrival, or simply relax into your overnight accommodations. Overnight Anchorage hotel. The tour wraps up with a transfer from your hotel to the Anchorage airport. On the flight home, watch out the airplane window for spectacular views of snow-covered mountains and winding glaciers as you savor your memories of an incredible adventure in the Last Frontier.